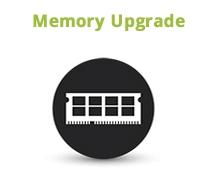 Laptop Memory upgrades is needed if your laptop running slow when multiple programs are open. In other words, you want an easy way to add a few more years of life to your laptop? As new software is released it is designed for newer laptops with much more memory. Since the Older laptops usually don't have enough memory to run these programs effectively. We can upgrade your laptop RAM and give you the ability to run the latest software and give your laptop a big overall power boost! We are a true nationwide provider of Laptop Memory Upgrades, Laptop professional repair services as well as iPhone repair. Besides repairs at our Laptop Memory Upgrades services, Laptop repair, PC Computers and laptop repair service center in Bellville Cape town, we have upgraded Laptop memory for customers all over South Africa including Johannesburg, Pretoria, Durban, Kimberley, Bloemfontein, Port Elizabeth, Polokwane, Pietermaritzburg and Nelspruit plus many other South African cities. If you would like to use our professional Laptop memory upgrade services but don't live close to our Laptop repair service center, click here for information on sending us your Laptop for professional repair through our express courier service. We can usually upgrade your memory in under 20 minutes. The service price includes installing new memory in your laptop. The price of the RAM modules is not includes in the price.